Home > Vitamins & Your Health > Vitamin E Rich Diet: Reduce Risk of Alzheimer's? Alzheimer's disease is a form of dementia, and leads to increasing levels of confusion and memory loss. In Alzheimer's disease, plaques and tangles form in the brain. Alzheimer's disease is the most common form of dementia, and is most often seen in people over 65. The causes of Alzheimer’s disease are not clear, but one cause may include a form of damage called by oxygen molecules, called ‘oxidation-induced damage’ or ‘oxidative stress’. The brain is especially vulnerable to this kind of damage, because it has a particularly high metabolic rate and so a high demand for oxygen. Vitamin E is a group of fat-soluble vitamins, including four tocopherols (alpha-, beta-, gamma- and delta-tocopherol) and four tocotrienols (alpha-, beta-, gamma- and delta-tocotrienol). All eight have antioxidant activity. The study was carried out by a group of researchers in Rotterdam, in the Netherlands, and published in a journal called Archives of Neurology in July 2010. The researchers followed over 5000 people who were 55 or older for an average of 9.6 years, and looked at four different antioxidants in their diets – vitamin E, vitamin C, beta-carotene and flavanoids. The people who ate the most vitamin E were 25% less likely to develop Alzheimer’s disease and dementia compared with the people who ate the least. This may be because the antioxidant activity of the vitamin E prevents or counteracts the oxidation-induced damage. The other antioxidants did not seem to have an effect. Other studies have shown that diets rich in vitamin E, including Mediterranean-style diets involving olives, nuts, beans and vegetables, may reduce the risk of Alzheimer’s disease by 38-54%. Supplements often only contain alpha tocopherol, and a study in Chicago suggested that high levels of vitamin E from food, containing the full range of types of vitamin E, might be important in protecting against Alzheimer’s disease. This study showed a 67% lower risk of Alzheimer's in the people who had the highest intake of vitamin E from food. Another study, from the Journal of Alzheimer’s Disease in 2010, showed that people with the highest levels of all eight vitamin E forms had a 45% reduced risk of Alzheimer’s disease compared with those with the lowest levels. 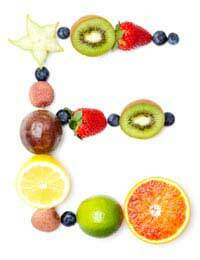 Vitamin E may also help prevent heart disease, and cancers including prostate and breast cancer. Meat and dairy products contain moderate amounts of vitamin E. The daily recommendation is 4 mg per day for men and 3 mg per day for women. Because vitamin E is fat soluble, it can be stored in the body. Stopping smoking, reducing the risk of type II diabetes by losing weight and taking more exercise, and reducing stress and keeping calm, may also reduce the risk of developing Alzheimer's disease or dementia.